Connecticut seniors on Medicare are more likely to take sedatives for insomnia and medications for depression than their counterparts across the country, according to a new report by Dartmouth researchers. An analysis of state data in a national report by the Dartmouth Atlas Project also shows that Connecticut’s Medicare program relies heavily on brand-name drugs, versus generics, especially in wealthy towns in Fairfield County – a factor that could be contributing to the state’s ranking in the top 10 nationally in prescription drug spending per patient. Connecticut seniors spent an average of $2,795 on medications in 2010 – 45 percent higher than the lowest-spending state, Minnesota, and the highest rate in New England. The new report provides an in-depth look at how prescription drugs are used by Medicare beneficiaries, age 65 and older, in the program’s Part D drug benefit, which had 37 million enrollees in 2012. It shows wide variations in the use of both effective and risky drugs among the 306 regional health care markets across the U.S. The geographic swings in prescription quantity and quality “suggest that there’s something in the regional practice culture, and perhaps in the patient culture, that is driving these patterns,” she said. Data included in the report, from 2010 Medicare claims, shows that Connecticut fares better than average in prescribing “effective” drug therapy to patients with certain serious conditions, such as heart attacks and diabetes. More than 81 percent of patients hospitalized for heart attacks were continuing to receive the recommended beta-blockers seven to 12 months after a heart attack – higher than the national average of 78.5 percent. In the area of discretionary medications, Connecticut’s use of antidepressants for seniors was slightly higher than the national average – 19.1 percent, compared with 18.8 percent. The rates among hospital regions varied – from a low of 15.5 percent in Milford, to a high of 22.6 percent in Meriden. Similarly, patients receiving care in Stamford and Greenwich had higher-than-average rates of prescriptions for newer sleep sedatives, such as Ambien – 11.1 percent and 10 percent, respectively, compared to 7.6 percent nationally. That was double the prescription rate for patients in Putnam and Derby. By state, the use of so-called “sedative-hypnotic” medications by Connecticut seniors was the highest in New England, the data shows. While the newer sedatives initially were considered safe, recent reports have shown they can cause persistent drowsiness, as well as other side effects that may be more pronounced in the elderly, Morden said. The prescription rate for dementia drugs also varied, from a high of 9.3 percent in Meriden, to a low of 5.3 percent in New Milford. The statewide rate was lower than the national rate of 7 percent. Generally, the use of “high-risk” medications in Connecticut also was lower than the national average. The researchers said the regional differences in the use of discretionary and high-risk drugs, some of which have uncertain benefits, raise concerns. “[The] regional variation highlights the absence of a ‘best practice’ consensus” for the drugs, the report says. Overall, Connecticut patients filled a lower-than-average number of prescriptions in 2010 – 46.5 per patient, compared with 49 percent nationally. Still, the state’s costs per patient were high. By hospital area, Meriden had the highest drug spending — $3,248 per patient — while Winsted had the lowest spending– $2,354 per patient. Morden said the research team found no correlation between higher spending and the rate of “effective” drugs being dispensed – dispelling the notion that higher spending means better care. Instead, spending is driven by the number of prescriptions – which were below average in Connecticut — and medication costs, she said. “If you see high spending, without high quantities, it’s fair to assume that your prescribers are selectively using more expensive products,” she said. 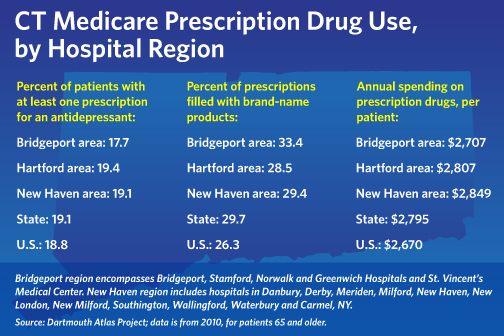 Connecticut’s proportion of brand-name prescriptions, versus generics, was the highest in New England, at nearly 30 percent. All other neighboring states were well below the national average of 26.3 percent. By hospital area, Greenwich, Stamford and Norwalk had the highest brand-name usage rates, with Greenwich nearing 40 percent. Branded drugs are generally more expensive than their generic alternatives, although they are therapeutically equivalent. Nationally, only a few communities, including South Miami, Fla., and Encino, Ca., had brand-name use rates as high as Greenwich. For some illness types and severities, only brand names are available. But the Dartmouth team found that illness explained only 27 percent of brand-name use; the reasons driving the choice remain largely unknown. Ellen Andrews, executive director of the Connecticut Health Policy Project, said differences in physician practice styles could explain some of the spike in brand-name use. “There’s a lot of geographic variation in how doctors prescribe,” she said. She also noted that prescription costs are just one piece of the health-care picture, which includes hospitalization rates and other measures. While the study focuses on drugs, it shows that Connecticut’s Medicare spending on other services also is high. The state ranked ninth highest nationally in 2010 in non-prescription medical expenditures. Morden said that generally, high use of brand-name drugs “doesn’t make any sense, clinically” and is likely driven by patient or prescriber preferences. Because the complex Part D Medicare structure leaves patients responsible for a significant portion of drug costs, income could be a factor in decision-making. Nationally, the report found that seniors in the Miami region had the most prescriptions – nearly 63 per patient in 2010. Manhattan also was high, at 54 prescriptions. Seniors in Miami also had the highest average spending on prescriptions, at $4,738; and the highest rates of at least one antidepressant prescription and dementia medication. Manhattan held the top spot for sleep sedatives, with 15.3 percent of patients receiving a prescription. The researchers said they hoped the report would prompt policymakers to take steps to equalize care, so that it is not a function of a patient’s zip code. “Regional variation of the magnitude presented in this report . . . presents an opportunity for policymakers to study successful regions that provide effective care efficiently, determine what factors lead to this success, and disseminate these systems more broadly,” they said.